In this Fenix Build Guide, we provide an overview of his strengths, abilities, talents and matchups. Fenix is undoubtedly my favorite ranged Assassin and one that I've already played a great deal of (gotta love the PTR!). He has a kit that's not only capable of dealing consistently high damage, but one that's also varied and - if I'm honest - fairly bloated. If you compare Fenix to Valla or Raynor, both of which are designed to deal high consistent damage, Fenix is leagues ahead of both. Not only does he have no mana or energy costs, but he also comes equipped with an amazing escape ability (Warp), an incredible shield that replenishes itself, fantastic AOE damage in Phase Bomb, and an even stronger Heroic in Purification Salvo. All things combined leave me in no doubt that he's not only overtuned, but one of, if not the strongest ranged assassin the game. If you also consider that Fenix can comfortably trade with most Heroes when he chooses the right Talents (see below) and can cut through structures in seconds when Repeater Cannon is on full auto, there's little wonder players are already reaching for the ban button. While repeated crowd control shuts him down, and spikes of damage can blow through his shielding quickly, it doesn't change the fact that Warp can get him out of almost every sticky situtation. Shield Capacitor (Trait) - Undoubtedly one of the strongest Traits in the game, Shield Capacitor provides Fenix with a scaling shield that replenishes over time. Although you need to be out of combat for it to regenerate, going into a fight with it full ensures you can mitigate a great deal of damage and go toe-to-toe with most enemy Heroes. If nothing else, Shield Capacitor ensures you can withstand more punishment, without having to constantly return back to your Core, or tap a Fountain. Plasma Cutter (Q) - The strength of Plasma Cutter isn't instantly apparent, and yet it's partly why Fenix is so strong. Cast in a circle around him, with the player determining how close to, or from from Fenix it's radius is cast. Not only that, but you're able to also decide the starting point of the Plasma Cutter, in order to hit a specific target as it starts its rotation. To be truly effective with Plasma Cutter, you need to quickly determine how far you want the rotation to occur, but also where (this typically has to be done very quickly). In most instances, you can get away with casting it at maximum range, and by pin-pointing just one enemy in front of you. However, if you're near to an opponent or being dived from different angles, you'll need to switch things up. Weapon Mode (Repeater Cannon/Phase Orb) (W) - Fenix has access to two weapon modes at all times: Repeater Cannon and Phase Orb. For the most part, you'll be using Phase Orb simply because it allows you to poke from further away, deal AOE damage and hit harder for each Orb you send out. In contrast, you'll often use Repeater Cannon for 1 on 1 encouters, attacking single targets in a team fight when you can, and clearing objectives (such as a Golem or Immortal). It's incredibly important to freely swap between both modes, and not find yourself stuck in one. Warp (E) - Without doubt one of the strongest "escape" abilities in the game, Warp allows Fenix to teleport after a very short delay. Not only does this allow him to mitigate all damage he might suffer just before he teleports, but renders Heroics such as Tracer's Pulse Bomb redundant (using Warp just as it detonates mitigates all its damage). As long as you have Warp available, you can get out of almost any situation and considering the default range is pretty far, few Heroes can catch you. I should also add that despite being a defensive ability, Warp can be used aggressively. Against someone like Kael'thas, you can Warp immediately next to them, cast Plasma Cutter, and repeatedly hit them with Repeater Cannon: it's often a free kill. Planet Cracker (R) - With a lengthy cooldown but dealing massive damage, Planet Cracker is already proving popular. In reality, it's Fenix's worst Heroic. Not only is it easy to avoid, but you'll rarely gain full value from it as once enemy Heroes have left its path, its value is significantly reduced. Although I've had limited success with it on Braxis Holdout and Haunted Mines (on defence), there's little value in taking it over Purification Salvo, especially considering it also means you have to remain stationary when casting it. Purification Salvo (R) - Allowing Fenix to target, and then release a barrage of missiles to those he locks onto, Purification Salvo not only deals huge damage, but sees its damage increased significantly against slowed targets. Just be aware that as Purification Salvo is acquiring targets, if enemies move out of its range, or you're hit with crowd control, the Heroic will fail, and it will go on cooldown. If you can, try to use it at maximum distance and after Plasma Cutter has tagged a few Heroes. If you do, it can often clean up against low health teams'. Arsenal Synergy allows Fenix to boost the damage of his Phase Bomb by 150% after landing 3 basic attacks. It's easy to maintain, and offers Fenix massive ranged AOE burst to follow up with. Whether 1 on 1, or clearing a wave, it's incredibly strong. Without shields, Fenix is incredibly vulnerable and even more so if Warp is on cooldown. Emergency Protocal allows Fenix to gain 25% movement speed for 5 seconds when his shield drops, allowing you to kite and escape easily. Building on the value of landing basic attacks, Warp Warfare is an aggressive Talent that allows Fenix to dive and deal rapid damage. After using Warp, he'll gain 175% attack speed for 4 seconds, allowing him to cut through a single target incredibly quickly. Capable of attacking an entire enemy team, and dealing massive damage after a well timed Plasma Cutter, Purification Salvo can track enemies, kill those who're low and soften up those who're just starting a fight. Auxiliary Shields lowers Fenix's maximum health by 10%, but increases his maximum shielding by 15%. Not only that, but it allows Fenix to restore his shielding through basic attacks, with 10% of his damage dealt contributing to their regeneration. When going toe to toe against a single Hero, or clearing a camp with your Phase Bomb, Auxiliary Shields provides amazing sustain and is worth the health loss. Building on Warp Warfare, Offensive Cadence allows Fenix to deal 6% bonus damage (based on maximum health) every 3rd basic attack, against a single target. Combine this with your level 1 and 13 Talents, Fenix can rip through players at frightening speeds. Variable: Providing Fenix with a flat 15% basic attack damage increase when his shield is active, Photonic Weaponry stacks with the damage multiplier of Mobile Offense and Phase Bomb. It allows Fenix to deal very high damage, also allowing him to regain more shielding (thanks to Auxiliary Shields!). 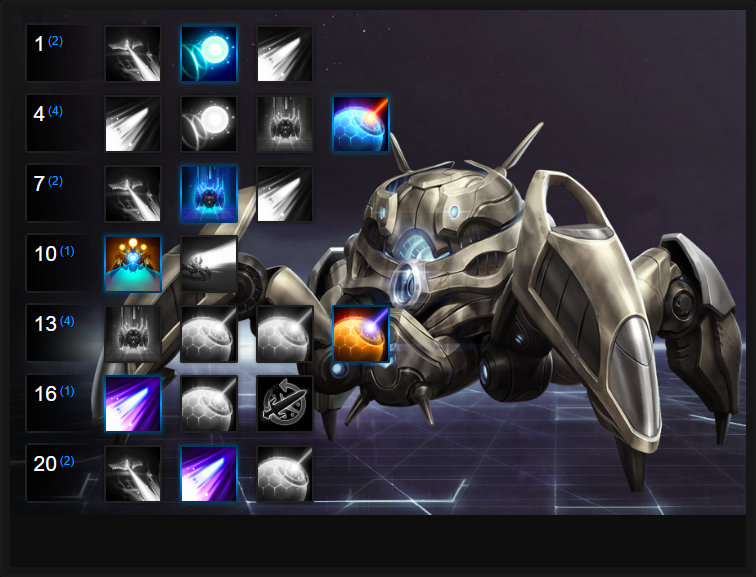 Bolstering Fenix's weaponry, Singularity Charge grants a further 100% attack speed when using Repeater Cannon, and 2.5 more range on Phase Bomb. Regardless of which mode you're in, it allows for far greater damage and/or poke. These Hero Threat Levels (1 being lowest threat and 10 being highest threat) are to help you determine which enemy Heroes can give you a headache. For the Heroes listed here, take extra care as they're particularly dangerous for Fenix. This list of tips and tricks are just a handful of things we think will help your Fenix play. We'll continue to add to the list as required and if you have any tips you'd like to share, let us know in the comments below and we'll place them here. 1. Remember that your shield will only regenerate when you don't take damage for 5 seconds, and takes a total of 10 seconds to fill completely. 2. Always go into a fight with a full shield. It significantly increases your chances of survival, and "out trading" the opposition. 3. Although your Trait lets you trade easily against most Heroes, you can still die quickly against the likes of Zul'jin or Valla who deal quicker, harder hitting damage. 4. Plasma Cutter takes practice to use, especially if you want to hit multiple targets - and one specific target within that group. Remember the small circle indicates where your Plasma Cutter will start. Hit the testing area to practice the ability without cooldowns. 5. Try to always slow enemies running away from you. The 25% decrease in their speed ensures you can stutter step behind them, allowing you to constantly trigger Mobile Offense. 6. Plasma Cutter works very well against Knight camps. If you kill the Wizard with your Repeater, you can then use Plasma Cutter + Phase Bomb to easily kill the remaining 3 (without taking damage). 7. Don't be afraid to use Plasma Cutter when retreating, even if you use it at its closest distance to Fenix. The 25% slow will allow you to escape most encounters, as long as you aren't hit with crowd control. 8. Repeater Cannon is best used when you can position yourself on the edges of a fight, taking down a single high-value target. Alternatively, ensure you've got it equipped when gunning down structures or an AI controlled objective. 9. Phase Bomb is incredible for early game push. The fact you gain increased attack distance, an AOE splash, and higher attack damage thanks to Mobile Offense, ensures few teams can withstand the bombardment. Combine this with no mana or energy costs, and Fenix can boss a lane with ease. 10. Make use of the AOE splash Phase Bomb provides to quickly clear lanes. It allows Fenix to rush them, and rotate with ease. 11. In team fights, if you're against a dive composition or getting too close is risky, just stick with Phase Bomb. Its damage is very high, especially post level 13, and can seriously pressure any team who choose to stick together. 12. Warp allows Fenix to move over scenary, or to evade abilities that will cause him significant damage. If your shield is down, use it to escape and regenerate. 13. Warp can mitigate most high damage abilities, and renders Heroics such as Pulse Bomb or Pyroblast redundant if you teleport at the last second. 14. Purification Salvo still deals high damage without Plasma Cutter's slow effect, so use it when you can to kill low health Heroes. The low cooldown on Purification Salvo makes the ability fairly forgiving. 15. You cannot move when using Purification Salvo, so choose your arming location wisely. Thanks for reading our Fenix build guide. You can help support its updates by subscribing to Ten Ton Hammer. Here's the details.